PROBLEM ADDRESSED Patients have to wait too long to see their family physicians. Open access, a new approach to office scheduling, has shown promise in reducing patient wait times to see primary care physicians. OBJECTIVE OF PROGRAM To offer same-day appointments to most patients who call the office, thus reducing wait times as measured by the third available appointment. Reductions in no-show rates have also been reported by those who have adopted the open-access system. PROGRAM DESCRIPTION Following extensive preparation, a 2-site academic practice in Halifax, NS, adopted open-access booking in October 2008. Data on third available appointment times, no-show appointments, and patient volumes were tracked before and during the yearlong implementation. CONCLUSION The clinics recorded a substantial, sustained reduction in third available appointment time, indicating improved patient access. There was also a decline in no-show appointments. Patient volumes were unaffected. The Dalhousie Family Medicine program operates 2 clinics in Halifax, NS: Camp Hill Family Medicine Centre (3 teams that have approximately 20 000 patient visits per annum) and Cowie Family Medicine Centre (2 teams that have approximately 10 000 visits per annum). Before implementation of open-access scheduling, both clinics used a traditional scheduling system in which patients were booked at their requests until each day’s appointment slots for each physician were filled. The last appointment of the day was left open for more urgent same-day bookings. Patients could only be assigned to these slots after consultation with the team’s registered nurse. Typically, physicians were fully booked days to weeks ahead. In 2007, the Medical Director of both clinics had participated in an educational session provided by the Institute for Healthcare Improvement and had become convinced of the merits of the open-access booking system. A series of presentations and information on the concept were provided to faculty at both sites. In June 2007, an ad hoc Open Access Committee, comprising physicians, a nurse, a resident, and support staff, was formed to study the issue and bring a proposal to faculty. The proposed booking system was discussed at several faculty and clinic staff meetings. A community physician who had adopted open access was invited to speak to all staff and answer questions about her experience. A small survey of physicians and nurses indicated a willingness to try the new system. In June 2008, faculty members committed to a 6-month trial to commence in October 2008. They requested ongoing study of the effect of the implementation. The main objective of the study was to determine the effect of open-access scheduling on 1) patient waiting time in our 2 clinics, 2) no-show rates, and 3) patient volumes. A secondary, longer-term objective was to measure satisfaction of all stakeholders (ie, clerical staff, patients, physicians, and registered nurses) with the system. The third available appointment time for a particular physician (also referred to as lead time) was chosen as a measure of patient access to eliminate variability due to day-to-day changes. This index counts the number of days from a theoretical patient request until the third next appointment slot for a given physician.14 This value was calculated approximately weekly for each physician in both practices and tabulated in a spreadsheet. The values for all physicians were averaged to determine the average clinic wait time by month. In our practice, a no-show appointment is defined as one which the patient does not attend or cancels with less than half a day’s notice (eg, canceling the afternoon before a morning appointment or the morning before an afternoon appointment). Clinic practice is for clerical staff to mark each no-show in the electronic medical record (EMR). For both clinics, volumes of no-shows were compiled monthly from the EMR by 1 clerical staff member, following a protocol provided by the EMR vendor. Patient volumes were compiled monthly from the EMR by a senior clerk for both sites. The Capital Health Research Ethics Board determined that the initiative was a program development or delivery-of-service protocol and did not require review. The Open Access Committee met regularly and developed a plan to implement the system. Some physicians who have previously implemented this system describe a process of eliminating backlogged appointments by working extra hours to catch up. We did not believe that was feasible at our sites. Instead, the sites selected an advance date when the number of pre-booked appointments was to be limited. It was agreed that prebookings would be limited to the first and last hour of the clinic day subsequent to October 21, 2008. Education of staff, physicians, and patients was determined to be a priority. To educate patients, an information video was produced and played about once per hour at both family medicine sites for the month leading up to the implementation of open access. The video explained why the sites were switching to this booking system and how it would affect patients. A clinic handout with common questions and answers was also available in waiting rooms. For several months before the go-live date, education meetings were held with the clerical staff. The implementation process of the new system was explained, and staff members’ questions and suggestions were addressed. Written booking protocols were developed and modified for staff. In preparation for the launch of open access, the telephone system was reconfigured to route calls to other clerical staff if all regular booking lines were occupied. This was done owing to anticipation of an increased number of calls when the telephone lines opened in the morning. Open-access scheduling began the third week in October 2008. On the same day patients called, they were offered appointments with their preferred physicians or the residents who worked under their preferred physicians. If their own physicians were fully booked (or not in) that day, patients were offered appointments with other available physicians on the same team. If that team was full, openings for other teams were offered. If the patient wanted to book for a future date, only appointments in the 9:00 to 10:00 am and 3:30 to 4:30 pm periods were made available. After noon, an additional hour was opened up from 10:00 to 11:00 am the next day for patients who called but could not be accommodated that day. The slot for prebooked appointments in the afternoon proved somewhat problematic. Two different times were attempted: the first and last hours of the afternoon. Each one was associated with some patient dissatisfaction. The decision was made to simply place the appointments anywhere requested by the patients to a predefined maximum of 30% to 40% of available slots. Patients who were unable to use open access were offered prebooked appointments after discussion with their physicians. After a 6-month trial, faculty members approved a motion to extend the initiative and evaluation for another 6 months. For the statistical analysis, we compared the 9 months before the implementation with the same months after implementation. We used t tests to determine if there was a significant difference between the 2 time periods. The time to the third available appointment dropped from an average (SD) of 13.7 (1.93) days for the months of January to September before the trial of open access to 3.6 (0.78) days for the same period after implementation (P < .0001) (Figure 1). Monthly no-show appointments dropped from an average (SD) of 3.33% (0.76%) for the same period to 1.89% (0.32%) following the adoption of open access (P < .001) (Figure 2). Total patient volumes at both sites were essentially unchanged when comparing January to September 2008 (21 838 visits) with January to September 2009 (21 819 visits). This was a decrease of only 19 visits (less than 0.1%) over the 9-month period. No. 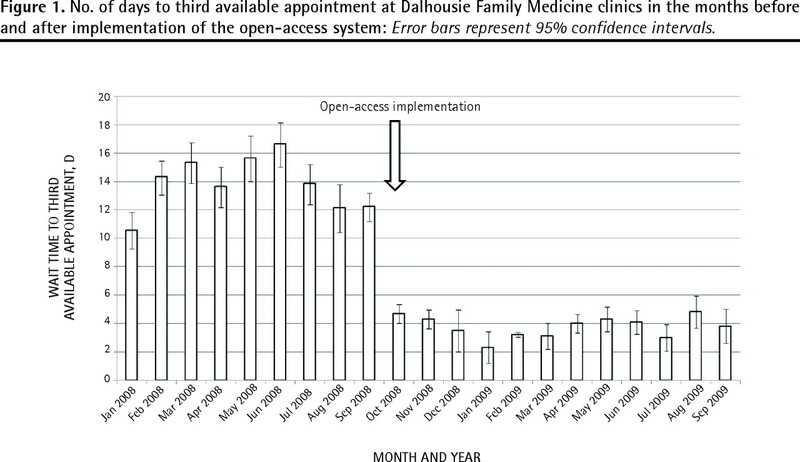 of days to third available appointment at Dalhousie Family Medicine clinics in the months before and after implementation of the open-access system: Error bars represent 95% confidence intervals. In January 2010, faculty members reviewed the data from the 1-year trial and voted to adopt the system. Some physicians have expressed concern with patient continuity. This was not measured before implementation of open-access scheduling, and assessment of the effect of the system on continuity in our setting will be difficult. We are currently analyzing data on patient and staff satisfaction with the implementation of open access and this will form the basis of another report. The effect of open-access scheduling on no-show rates has been variable. Some practices reported reductions in no-show rates, including a local Halifax private practice (data not provided),4 pediatric practices (21% to 9%),16 and geriatrics clinics (18% to 11%).8 One study showed a reduction in no-show rates but found that it was not directly related to the third available appointment.17 In some studies, no-show rates demonstrated no significant change6,15 or changes that were not significant when adjusted for within-subject variation.5 Bennett and Baxley claimed that other factors such as continuity were more predictive of no-shows than the time to third available appointment was.17 The no-show rates for Dalhousie Family Medicine were very low to begin with compared with these practices and were quite variable. However, the difference between pre-implementation and postimplementation of open access was significant (P < .001). There are several potential limitations to our data. The time to the third available appointment was collected and tabulated manually, introducing the possibility of human error. However, because the same person collected this information over the course of the study, it is unlikely this error would bias the results in different directions before and after implementation. The no-show data were weakened by several factors. Although the rate was abstracted from the EMR, variability in how this attribute was assigned to patients by the booking staff was noted. The data were collected by multiple persons and we had several changes of clerical staff during the trial. Appointments that were not kept without a half-day notice were to be recorded by staff and the patients billed for the missed appointments. However, staff did not always faithfully record the missed encounter as a no-show. For instance, appointments were sometimes changed to another time at the last minute instead of being recorded as no-shows. Unfortunately this inconsistency and the resulting question of data reliability is a limitation in any office setting where patient data are collected by clerical staff rather than research staff. There is, however, no reason to suggest that clerical staff biased the results by changing their handling of no-show information following implementation of open access. It is possible that some other factors were responsible for the improvements in access to physicians. Physicians departed the practice and several new physicians joined the practice during the trial; however, none of these retirements or recruitments was in October 2008, corresponding to the commencement of the trial. This would make the changes in staffing an unlikely reason for the results. An improved telephone system was put into place just before the trial started; it allowed for calls to be picked up by additional staff when the main receptionists were occupied with other calls during the morning peak period. However, it is difficult to postulate how this could reduce calculated wait times for appointments, which were limited by access to booking slots, not by access to clerical staff. Before the adoption of the open-access system, several physicians had voiced concerns that the volume of patients would be adversely affected (some predicted an overwhelming demand and others a drop in attendance). There was no real change in patient volumes, comparing the same 9 months used for the wait-time analysis before and after implementation. One of the factors crucial to success was support for the clerical staff members. During implementation of open access, staff members were provided with weekly meetings that focused on problem solving. After a period of time these meetings were discontinued. However, it soon became apparent that the agreed-upon booking rules were not being universally followed. These were addressed with discussions in monthly staff meetings and recirculation of the directives for booking. These measures had only limited success. A particular problem was a tendency for some physicians to revert back to fully booking sessions in advance. Reasons given for this were both patient and physician demand for prebooked appointments. A larger-than-anticipated number of patients insisted they needed to make arrangements in advance or desired it for convenience as they left the clinic. As well, several physicians directed staff to override the booking rules to book patients for follow-up later. As a result of this internal demand, some physicians were again starting the day heavily booked, with limited ability to accommodate same-day booking. Patients who called expecting same-day appointments were being sent to other teams for care; this drew complaints from other teams who expressed frustration that their slots were being taken up by demand from other physicians’ patients. The root of this problem appears to be with overpaneled physicians (ie, doctors who have more patients in their practices than they can provide booking slots for). As proponents of open access have explained, no scheduling system can accommodate a mismatch between demand and supply. This situation needs to be addressed if adequate patient access to physicians is to be provided and working relationships are to be maintained in a group practice. We did periodic reviews of how fully booked teams were in advance. Typically, less than 40% of our team’s appointments were prebooked, although higher readings were occasionally observed. Because our protocol booked patients with other doctors and other teams when the regular physicians had full schedules, patients were not forced to wait for overpaneled physicians. Because those patients had opportunities to get appointments with other, more open, teams, we maintain we still had an open-access system at our practice despite having had some physicians and the occasional team prebooked at a rate that sometimes exceeded 40%. Open-access scheduling was successfully implemented in our academic teaching practice and resulted in improved wait times and reduced no-show appointments. The effects of open access on continuity and patient and staff satisfaction are being studied. Open-access scheduling can improve patients’ access to medical care; however, it cannot help physicians who simply have more patient demand than they can manage. Open access can be implemented successfully without the need for working extra hours to clear up backlog. Although open-access scheduling improves wait times and reduces no-show rates, many physicians continue to have reservations about changing how they book their clinic appointments. Poor continuity (ie, seeing the patients of colleagues) continues to raise concerns. Staff education and support were critical to effecting change in the medical setting. Un système de rendez-vous le jour même peut améliorer l’accès des patients aux soins médicaux; il ne peut toutefois pas aider le médecin qui a plus de patients qu’il n’en peut traiter. Instaurer ce système de rendez-vous n’exige pas nécessairement de travailler plus d’heures pour voir tous les patients. Même si le système de rendez-vous le jour même réduit le temps d’attente et le taux d’absences, plusieurs médecins continuent d’avoir des réticences à changer la façon de fixer les rendez-vous dans leur clinique. Le suivi des patients (i.e., voir les patients des collègues) est aussi un sujet de préoccupation. Instaurer un tel système dans le contexte médical requiert support et formation du personnel. Dr Cameron is project lead and corresponding author of this paper. Drs Cameron and Sadler contributed to concept, design, and implementation of the program; data gathering and interpretation; and preparing the manuscript for submission. Ms Lawson conducted statistical analysis and contributed to the writing of this paper.
. Advanced access: reducing waiting and delays in primary care. JAMA 2003;289(8):1035-40.
. Answers to your questions about same-day scheduling. Fam Pract Manag 2005;12(3):59-64.
. Implementing advanced access in a group practice network. Fam Pract Manag 2004;11(5):35-8.
. Same-day booking. Success in a Canadian family practice. Can Fam Physician 2008;54:379-83.
. A controlled trial of an advanced access appointment system in a residency family medicine center. Fam Med 2004;36(5):341-5.
. Implementing open-access scheduling in an academic family practice. Fam Pract Manag 2006;13(3):59-64.
. Open access in primary care: results of a North Carolina pilot project. Pediatrics 2005;116(1):82-7.
. The use of open-access scheduling for the elderly. J Healthc Qual 2007;29(6):45-8.
. When the clock starts ticking. Wait times in primary care. Discussion paper. Mississauga, ON: College of Family Physicians of Canada; 2006. Available from: www.cfpc.ca/local/files/communications/wait_times_Oct06_Eng.pdf. Accessed 2010 Jul 22.
. National Physician Survey 2007. Mississauga, ON: College of Family Physicians of Canada; 2007. Available from: www.nationalphysiciansurvey.ca/nps/2007_Survey/2007nps-e.asp. Accessed 2010 Jul 22. Same-day care for patients with urgent problems [Fast Facts]. Can Fam Physician 2008;54:418.
. Toward higher-performance health systems: adults’ health care experiences in seven countries. Health Aff (Millwood) 2007;26(6):w717-34.
. Canadian survey of experiences with primary health care 2007–2008. Ottawa, ON: Statistics Canada; 2008. Available from: www.statcan.gc.ca/imdb-bmdi/document/5138_D1_T1_V2-eng.pdf. Accessed 2010 Jul 22.
. Third next available appointment. Cambridge, MA: Institute for Healthcare Improvement; 2010. Available from: www.ihi.org/IHI/Topics/OfficePractices/Access/Measures/Third%20Next%20Available%20Appointment. Accessed 2010 Jul 22.
. 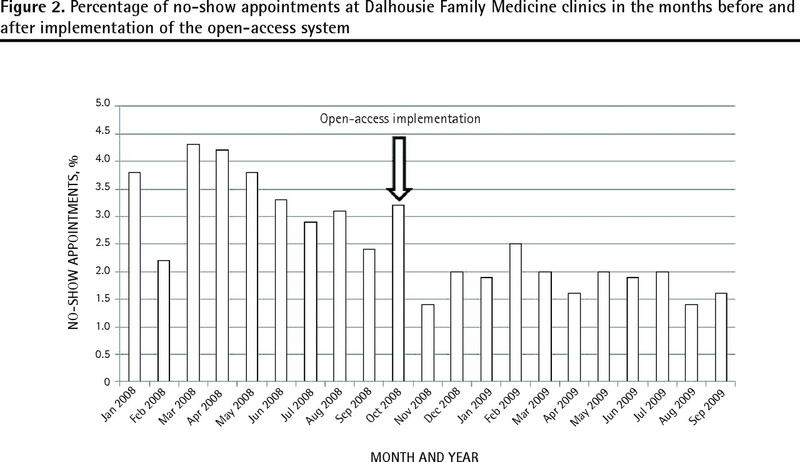 Implementing open-access scheduling of visits in primary care practices: a cautionary tale. Ann Intern Med 2008;148(12):915-22.
. Effect of open access scheduling on missed appointments, immunizations and continuity of care for infant well-child care visits. Arch Pediatr Adolesc Med 2006;160(9):889-93.
. The effect of a carve-out advanced access scheduling system on no-show rates. Fam Med 2009;41(1):51-6.